This growing practice is recruiting for a GP to join their time. The surgery opened in 2015. There are 8000 registered patients and Doctors are seeing around 30 patients a day. The practice is open 8.30am to 6pm Mon to Fri, Sat 9am -3pm and Sunday 9am to 1pm. Weekends are covered on a rota basis. There are 6 consulting rooms, one nurse’s room and one treatment room. Currently there are 3 full time and 2 part time GPs. You will be supported by a RN Nurse, an EN Nurse and reception staff. There is Pathology, Podiatry, Physiotherapy, Psychology and a dentist on site. It is a modern purpose built building with large windows and natural light; the consulting rooms are fitted out with the latest medical equipment. The staff believe in excellence in healthcare, professional ethics and have a supportive, helpful team who care about the community requirements and the people in it. The centre is based in one of the fastest growing suburbs in the South of Perth it is 10 km from Kwinana beach and 30 minutes from Perth CBD. Close to rural properties, schools, day care centres, and shops. 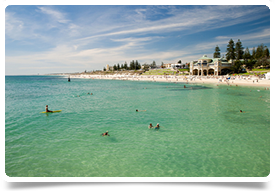 Perth is a located along the waters of the Swan River and the west of the city runs along the Indian Ocean. It is the state capital, a highly multi-cultural city and a top choice for expats. It is great for families with beautiful beaches to the north and south of the city. The clean, clear coastline offers great spots for swimming, surfing and water sports. It has a fantastic social scene with plenty of alfresco style cafés and restaurants.